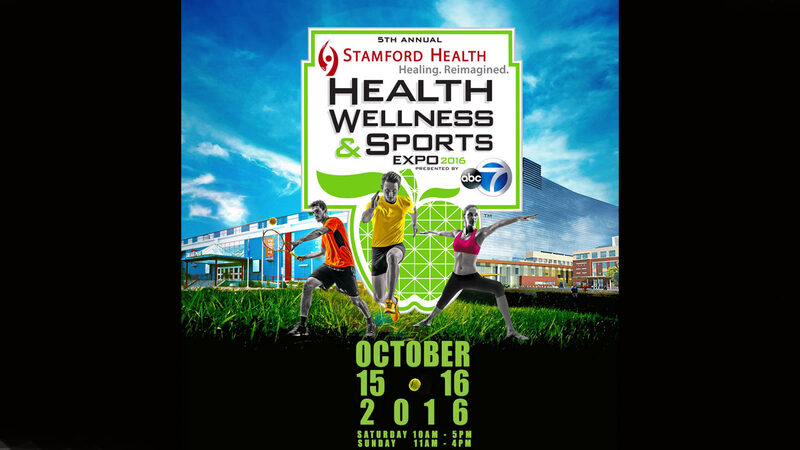 NEW YORK -- The much anticipated 5th Annual Stamford Health, Health Wellness and Sports Expo 2016 presented by WABC-TV will return to Chelsea Piers Connecticut, 1 Blachley Road in Stamford, Saturday, October 15, 10 a.m. to 5 p.m., and Sunday, October 16, 11 a.m. to 4 p.m. The premier health, wellness and sports expo in Connecticut will feature the latest products, services and demos from over 100 exhibitors, including wellness entrepreneurs from Shark Tank fame; fun activities for children; special guests; over 100 raffle prizes, healthy holiday shopping opportunities, plus insights about the state-of-the-art healthcare at the new Stamford Hospital, which officially opened September 26, 2016, and much more. Admission and parking are free. The public is asked to bring nonperishable food and purchase $5 raffle tickets for The Food Bank of Lower Fairfield County. Stamford Health will also offer free blood pressure screenings, chronic disease health risk assessments and hand hygiene tips. Hospital staff will provide information on a variety of medical conditions and treatments and children will enjoy the popular Stamford Health volunteer HAHA clowns. Flu shots will be available from CVS Health (insurance and/or cash payments accepted.) "We are pleased to again sponsor The Expo, which is a great opportunity for the community to explore important health issues and interact with many unique exhibits," said Vicki Hoffman, Director, Orthopedic Service Line, Stamford Health. Dance fitness sensation Billy Blanks Jr. of Dance It Out and Shark Tank will be back at Expo 2016 by popular demand. Known for programs that make working out fun, Billy will conduct his popular dance fitness class at no charge on Saturday, 1 to 2 p.m. and Sunday, 12 to 1 p.m. at the Chelsea Piers CT Athletic Club. To register for one of the classes, download the waiver form at hws-expos.com Billy will also make special appearances at a number of exhibits, including the ShopRite Live Right Zone, where he will whip up recovery shakes with Cora Ragaini, RDN, and offer post-workout tips. Additional "As Seen on Shark Tank" businesses will include Ry's Ruffery, producer of all-natural dog treats, and Dollop Gourmet, creator of all-natural, organic, gluten-free, dairy-free, non-GMO frosting, founded by Heather Saffer, who will offer samples and sell and sign copies of her book, "The Dollop Book of Frosting." Visitors can also meet Amy Freeze, meteorologist, Eyewitness News on WABC-TV, on Saturday from noon to 3 p.m., and Gillian Neff, health reporter and anchor on News 12 Connecticut, throughout Saturday. Joseph Rockman, MSOM, LMT, licensed acupuncturist at Mountainside, will demonstrate how acupressure and essential oils reduce stress and improve sleep and health, and life coach Shannon Malkin Daniels will sell and sign copies of her book, "Water Yourself: A Practical Guide to Weed Out the Bad, Get More Good and Live Your Dreams." There will also be interactive exhibits and demos, including martial arts from EBMAS CT and dancing with Arthur Murray Grande Ballroom of Greenwich. More than 15 area restaurants will be on board with healthy food samplings, including The Mumbai Times, Greenwich Salad Co., Sign of the Whale and Myrna's Kitchen, along with organic wine samplings from Val's Putnam Wines & Liquors. A complete list of restaurants can be found on the website. All visitors will receive a Passport For Life, provided by Healthcare News, to record their health screening results. Those who visit 40 exhibits can receive a complimentary day pass to Chelsea Piers Connecticut. There will also be hourly raffles for over 100 prizes, including a two-night weekend stay at the Stamford Marriott with breakfast for two and Agora Spa signature couples massage, and a tour for 10 people at WABC-TV newsroom in New York that includes watching a live broadcast of Eyewitness News at Noon. Those bringing nonperishable food will receive a free raffle ticket or raffle tickets can be purchased for $5. The raffle and a silent auction will benefit The Food Bank of Lower Fairfield County. Sponsors include Stamford Health, WABC-TV, Grade A ShopRite, EBMAS CT Martial Arts, Mountainside, Sacred Heart University, Shaklee: Debbie Miron, Independent Distributor, Healthcare News, News 12 CT, Stamford Magazine/Moffly Media, Star 99.9, 95.9 Fox, The Advocate/Hearst Media Services, Natural Awakenings Magazine, Macaroni Kid, Jen Danzi and Fairfield Parent Magazine.